Is it Time for Email Triage? For too long, I used my email inbox as a pseudo-task list. It was a way for me to keep track of all the little things I needed to get back to at some point. I heard somewhere that email is someone else’s task list for you. This one phrase changed my entire view. Email can quickly get overwhelming. No matter how hard you might try to stay ahead of it, the messages just keep coming. I have a confession. Today my inbox is sitting at just over 100 messages (down from the high of 272) and it’s time to take drastic measures. The only answer is what I call “Email Triage”. 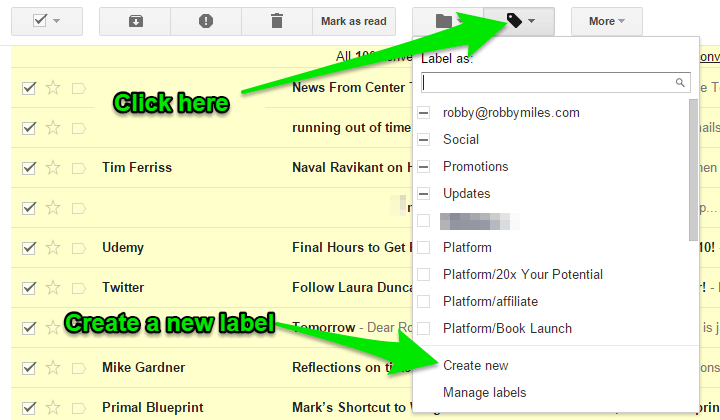 Here are the exact steps I use to get back to inbox zero and stay there. Log into your email account on your computer. Your mobile device won’t cut it for this task. Now set a timer for 15 minutes. Look through the list of emails and work through only the most urgent ones. After 15 minutes, move to Step 2. I’m going to show you how this works in Gmail. Other email clients will be different, but the same basic principles apply. Select all the message still left in your inbox after Step 1 using the check box at the top. Create a new label called “Review Soon”. All the messages in your inbox will now have the “Review Soon” Label. Chances are that you’ve been saying to yourself, “I’ll get to these messages soon.” If you’re like me, soon still hasn’t come and these messages are standing in the way of you and a clean inbox. This step may seem drastic, but remember you’re not deleting these messages. You are simply moving them somewhere you can focus on them when you plan time in your schedule. If a message is really important, I guarantee someone will send you a reminder email. Take the plunge and will all messages checked, click the “Archive” button. Relax…your emails are safe and retrievable at any time. Just go to the left sidebar and you’ll see the “Review Soon” label. Whoa, wait right there for a minute and let me give you a plan to keep your inbox clean. Set one time or several times per day to check email. Avoid constantly checking your email by disabling notifications on your devices. When you check email, deal with each message using the 2 minute rule. After you’ve dealt with any urgent or easy to answer emails, label the rest “Review Soon” and “Archive” them. Action Item: Try this system for 14 days. See if there is a noticeable difference in how you focus on the missions that matter, how you feel about email in general, and how productive you are each day.